The Dow Jones Industrial Average surged more than 400 points Friday as renewed optimism over trade talks between the U.S. and China put investors in a buying mood. The rally marked a turnaround from a day earlier, when disappointing holiday sales data led to a modest sell-off. Friday's gains helped push the benchmark S&P 500 index to its third-consecutive weekly gain. Financial, health care, technology and industrial stocks accounted for much of the broad wave of buying. U.S. markets will be closed Monday in observance of Presidents Day. Two days of trade talks wrapped up Friday in Beijing. China's government said negotiators will meet in Washington next week for more negotiations aimed at ending the trade war between the world's largest economies. A March 2 deadline hangs over both sides, after which the U.S. is set to impose additional tariffs on Chinese goods, escalating a trade dispute that has already raised costs for companies and consumers. President Donald Trump has said that there is a possibility he would extend that deadline if the two countries are close to a deal, however. Wall Street has been encouraged by the signals that Chinese and U.S. officials have sent in the latest round of trade talks that began Monday. That's given investors "hopefulness and maybe optimism surrounding some sort of resolution between the U.S. and China," said Willie Delwiche, investment strategist at Baird. "And maybe (both sides) keep talking and maybe delaying the implementation of the tariffs that are supposed to come into effect" on March 2, Delwiche said, "so, it's evidence of progress." The S&P 500 index gained 29.87 points, or 1.1 percent, to 2,775.60. The Dow climbed 443.86 points, or 1.7 percent, to 25,883.25. The Nasdaq composite rose 45.46 points, or 0.6 percent, to 7,472.41. The Russell 2000 index of smaller companies picked up 24.14 points, or 1.6 percent, to 1,569.25. Major European indexes also finished higher, as did gold and crude oil prices. 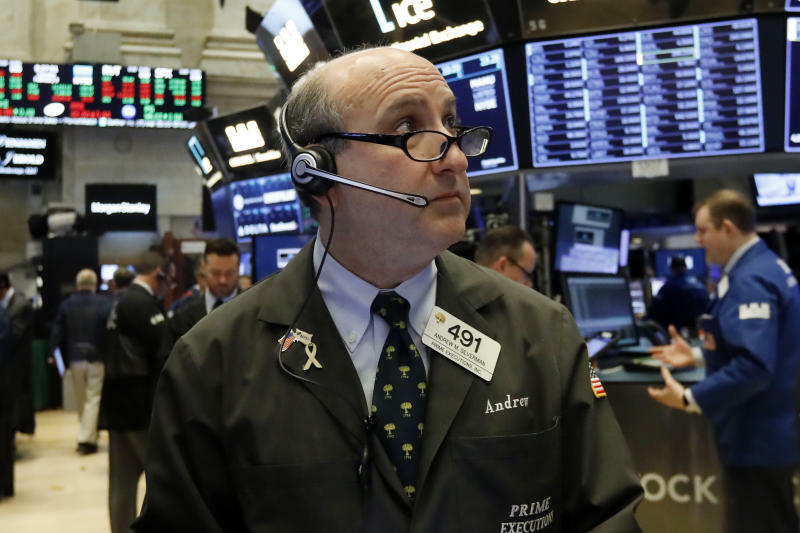 Markets moved higher for most of this week as investors grew more optimistic that the latest round of talks could move the U.S. and China closer to a resolution of their trade fight. On Friday, U.S. Trade Representative Robert Lighthizer told Chinese President Xi Jinping negotiators "made headway" in talks this week in Beijing. The Trump administration raised tariffs in July over complaints Beijing steals or pressures companies to hand over technology. The White House imposed 25 percent penalties on $50 billion of goods from China and 10 percent on $200 billion of other products. China retaliated by raising duties on American soybeans and other imports and ordering its companies to find other suppliers. While the trade conflict remains a focus of the market, a resolution may not be enough to ease a growing sense among investors that the global economy is slowing, setting the stage for weaker corporate earnings growth this year, Delwiche said. "I'm not one to think that getting this trade deal done is going to all of a sudden clear up a bunch of uncertainty around the economy, particularly the global economy," he said. "We need to see some evidence that the global economy is stabilizing. That's really where you're getting the downward pressure on earnings expectations." So far, S&P 500 companies have reported 13.1 percent earnings growth for the October-December quarter, better than the 12.1 percent gain projected by analysts. But the outlook for earnings growth in the first three months of 2019 has dimmed. Analysts forecast that corporate profits will fall in the current quarter, according to FactSet. That would represent the first decline in nearly three years. Corporate earnings continued rolling out Friday as the fourth-quarter reporting period nears an end. Chipmaker Nvidia rose 1.8 percent after reporting a strong fourth-quarter profit. Despite a downturn in revenue, the company expects demand to increase this year. Its forecast for the year topped Wall Street's forecasts. Nvidia has been hurt by a plunge in demand from the cryptocurrency sector and lower video game console sales. Snack and beverage giant PepsiCo gained 2.9 percent despite reporting relatively soft fourth-quarter results. Much like rival Coca-Cola on Thursday, the company gave investors a weak forecast for the year as it faces a stronger dollar. Unlike its rival, PepsiCo announced $8 billion in stock buy backs and a round of cost cuts. Agricultural equipment maker Deere slid 2.1 percent after warning that farmers are buying less new equipment because of the ongoing trade war between the U.S. and China. The company gave investors a mixed fourth-quarter report, with profit falling short and revenue beating forecasts. Newell Brands plunged 20.9 percent. The loss of retailer Toys R US hurt the company's core sales. Newell makes a range of baby products that were carried by the now defunct Babies R US. Mattel tumbled 18.3 percent after the toy maker issued a weaker-than-expected 2019 revenue outlook. The maker of Barbies and Hot Wheels named a new CEO last April and has launched a plan to restructure the company. Last week, Mattel reported that it swung to a profit in the last three months of 2018, but revenue was down 5 percent. U.S. benchmark crude climbed 2.2 percent to settle at $55.59 a barrel in New York. Brent crude, the standard for international oil prices, gained 2.6 percent to close at $66.25 a barrel in London. Bond prices fell. The yield on the 10-year Treasury note rose to 2.67 percent from 2.65 percent late Thursday. That yield is used to set rates on mortgages and other kinds of loans. The dollar fell to 110.45 yen from 110.49 yen on Thursday. The euro weakened to $1.1295 from $1.1301. Gold rose 0.6 percent to $1,322.10 an ounce. Silver gained 1.4 percent to $15.74 an ounce. Copper added 0.9 percent to $2.80 a pound. In other energy futures trading, wholesale gasoline climbed 4.3 percent to $1.57 a gallon. Heating oil rose 2.5 percent to $2.02 a gallon. Natural gas gained 2 percent to $2.63 per 1,000 cubic feet.